What better way to start the weekend then by lusting after a handbag - or a cocktail, whichever comes first in your time zone. But for now, let's talk handbags and then drink our sorrows away with the lapse in rent money we will have once acquiring this piece. 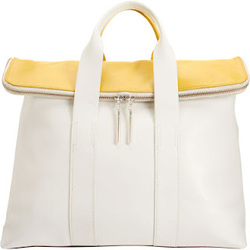 This 3.1 Phillip Lim 31 Hour bag seems like the perfect way to welcome the warmer weather while still allowing for your "kitchen sink" necessities that must be taken daily on the arduous commute to work. And for you vehicle commuters - just know that it's not nice to brag and I will actually be able to tell my children about walking to work...both ways....in the snow....and uphill (well a slight incline on certain streets).....and it keeps me slim - I win! But I digress back to my fanciful musings on this bag - the one that makes a more than 24 hour claim. If you must work 31 hours in a day - then dear god - please use this to help you get through - and then have that cocktail, or better yet - keep it in the bag. Surely there is enough room. Happy Friday! WANT! NEED! Give me one right now.